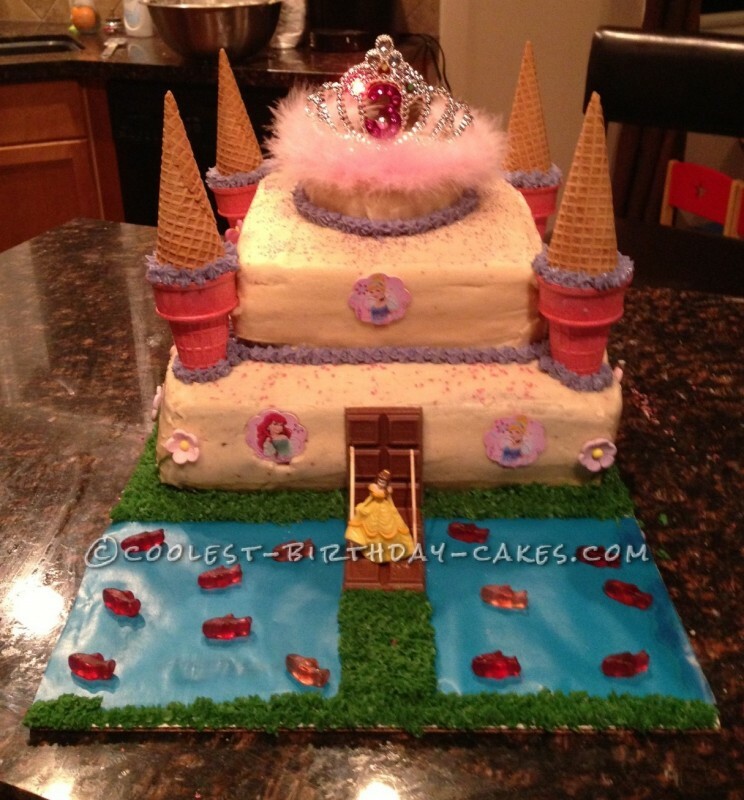 My daughter wanted a princess castle birthday cake so I decided to try and do a castle cake. I baked 3 12×12 chocolate cakes and 3 8×8 vanilla cakes and a small round vanilla cake and froze them over night which helps make them moister. Once the cakes were almost thawed I torted them to ensure they were level and then filled them (a layer of icing between each cake). I stacked the 3 12×12 cakes and then crumb coated and iced them and then used four wooden dowels to keep cake level. I then torted, filled and stacked the 3 8×8 inch cakes and the small round cake and crumb coated and iced them as well. I placed a dowel through the center of the cakes once they were all stacked to help keep them stable. Right after icing the cakes I sprinkled them with pink and purple cake sparkles. I used purple icing to do icing rosettes along the cake seams. I placed colored ice cream cones on the cakes for the towers, putting icing along the inside edge as glue and then placed a sugar cone upside down inside each ice cream cone. I had planned on coating the cones with melted white chocolate but ran out of time. I used edible flowers and butterflies to decorate the cake and used green icing to pipe the vines. I had the tray on a cake board and used green icing to do the grass and blue wrapping paper for the water. I used a chocolate bar for the castle door and drawbridge and toothpicks for the bridge chain. For the fish in the water I used organic Sharkies. 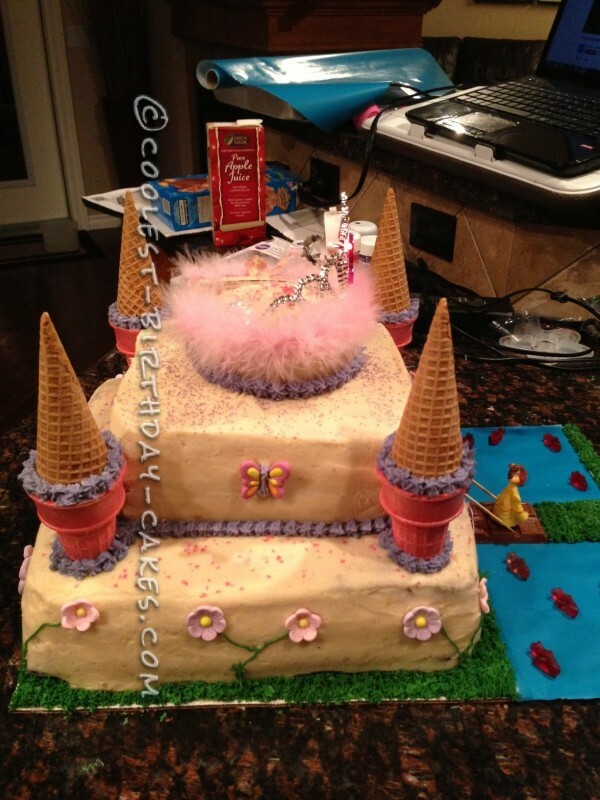 The tiara on top of the cake actually lights up and flashes around the number 3. The princess pictures came with cupcake decorations and I just bent the bottom cardboard that was meant to go into the cupcake and pushed it into the cake as a window. This was the first big cake I’ve made that hasn’t been decorated with icing rosettes and I had a lot of fun doing it. It did help a lot to have the icing and cake ready a few days in advance so the night before the party I just had to focus on the decorating.